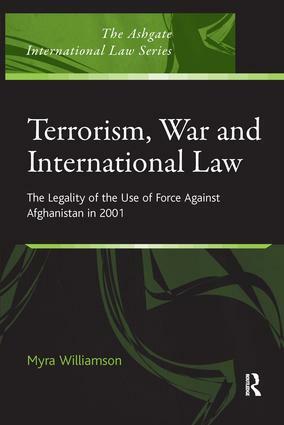 This book analyzes the legality of the use of force by the US, the UK and their NATO allies against Afghanistan in 2001. The work challenges the main ground for resorting to force, namely, self-defence under Article 51 of the United Nations' Charter, by examining each element of Article 51 that ought to have been satisfied in order to legitimise the use of force. It also examines the wider context, including comparable Security Council resolutions in historic situations as well as modern instances where force has been used, such as against Iraq in 2003 and against Lebanon in 2006. As well as making the case against the legality of the use of force, the book addresses wider questions such as the meaning of 'terrorism' in international law, the changing nature of conflict in the twentieth and twenty-first centuries including the impact of non-state actors and an overview of terrorism trends as well as the evolution of limitations on the resort to force from the League of Nations through to 2001. The book concludes with some insight into the possible future implications for the use of force by states, particularly when force is purportedly justified on the grounds of self-defence. Contents: Preface; Introduction; The changing nature of conflict; A definition of 'terrorism'; Evolution of limitations on the use of force: from the League of Nations to the United Nations - 1919-1944; Evolution of limitations on the use of force: from the United Nations Charter to the present - 1945-2008; The use of force against Afghanistan in 2001; Conclusion; Appendices; Index.